. 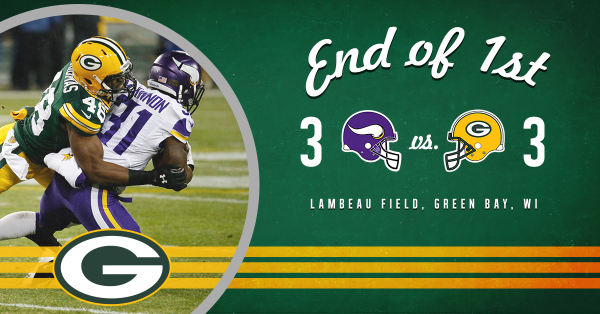 @EricKendricks54 stops Rodgers short of the 1st down and GB will go for it on 4th down. Richard Rodgers seemed to save that 4th-down conversion for Green Bay. Shoved Lacy over the line. GB picks up the 1st down to keep their drive alive. Both teams showing they're willing to be aggressive tonight. Eddie Lacy converts the 4th down for the Packers. 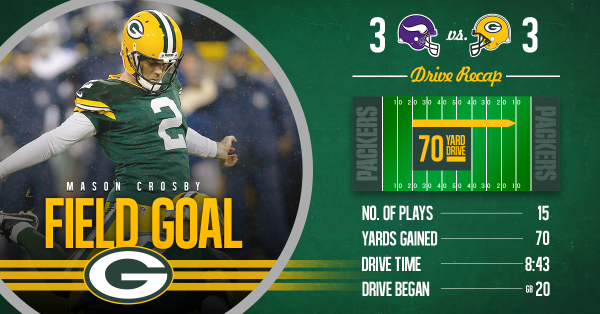 GB moves into the red zone on their 1st offensive drive. GB will attempt a FG after coming up short on 3rd down. Crosby connects on the FG and the game is tied at 3. Crosby is good from 28 yards out. thought the Packers O-line was all beat up? So McKinnon gets the kick return and Patterson did absolutely nothing to try to find a guy to block.
.@JetMckinnon1 takes the kickoff return for his first of the season.
.@AdrianPeterson picks up 6 yards on the #Vikings first play of the second drive. Game tied at 3 at the end of the 1st quarter. Rogers on pace not to get touched all nite! Per @ESPNStatsInfo , that's Bridgewater's 2nd-worst first quarter of the season (0-for-1 with a pick at Lions in Week 7).
.@HarriSmith22 and Tom Johnson combine on that sack forcing 4th and 14. Aggressive calls continue with a #Vikings ' zone blitz on 3rd-8. DE Hunter dropped into coverage. Packers punt. That was very un-Sherels like right there. Normally makes very good decisions.
.@HarriSmith22 is now 5th in #Vikings history among all DBs with 5.5 sacks. 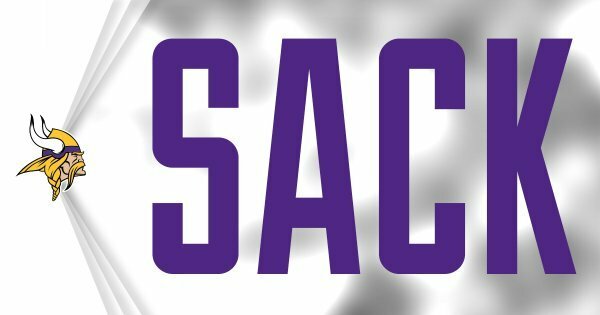 Joey Browner tops the list with 9.5 career sacks.
.@Wallace17_daKid moves the #Vikings to their 40 on the 3rd down catch from @teddyb_h2o .